While it’s our aim here at Books for London to get books into London’s tube and train stations, we’re also dead keen on other book swap initiatives as well. In our recent travels around the Interwebs, we’ve seen two more London-based swaps – this time South of the river. Rocketvan is a removal and delivery firm that also sells cardboard boxes and other stuff do with storage. Last year, they set up a bookswap shelf outside their shop under a railway arch on Union Street. Looks neat eh? Launched in May by a communications company, this bookswap shelf is close to the very good Menier Chocolate Factory theatre. 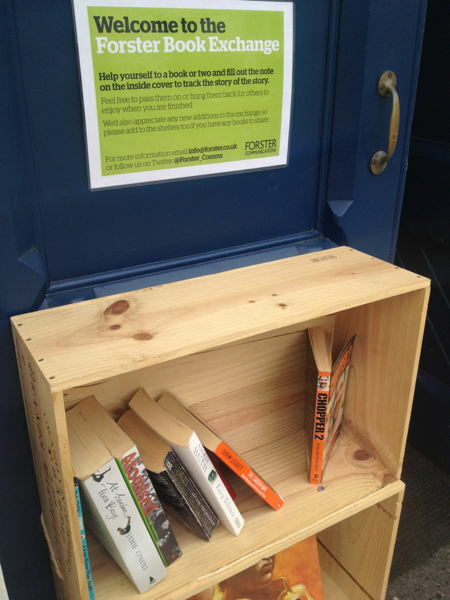 This bookswap also encourages readers to write a short review of the books by way of a special insert – what a great idea! The second one had gone last time I visited the Menier – succumbed to building works I think.